Visual Auditory Kinaesthetic — these three modalities can give some indication of people’s communication/learning preference. 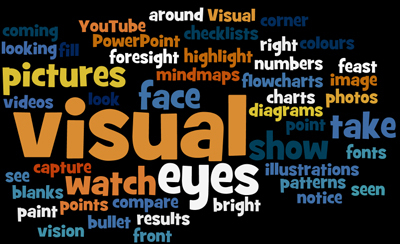 Visual communication/learning has two channels – linguistic and spatial. 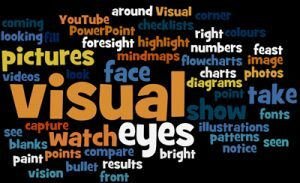 Visual-linguistic involves the written word and the visual-spatial involves the non-words, e.g. pictures, mindmaps. 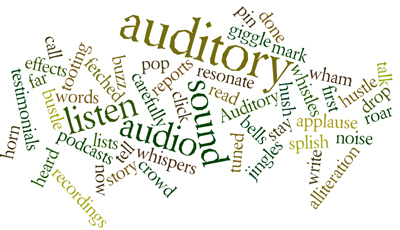 Auditory communication/learning involves the transfer of information through listening to the words spoken by others or the “noises” around us. Kinaesthetic communication/learning has two channels – tactile (touch) and kinaesthetic (movement). So the physical experience of doing things is the preferred modality. Check out the graphics below to pick up key words that help to clarify the distinctions. Now, the big question is, do you mix the modalities so that you can build rapport through the conversations you have with staff and students? Take some time today to “listen” to your conversations.